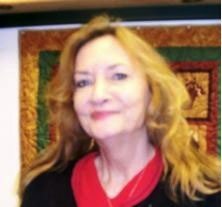 Our current host, Donna Glee Williams, is a writer of fantasies for the teenager in all of us, as well as being a seminar leader, dream worker, and creative coach. She has recently published two novels and her work has been featured in anthologies, literary magazines, academic journals, spoken-word podcasts, and more. She even came to the rescue and taught a recent weekend writing class at the Folk School when the scheduled instructor cancelled at the last minute. 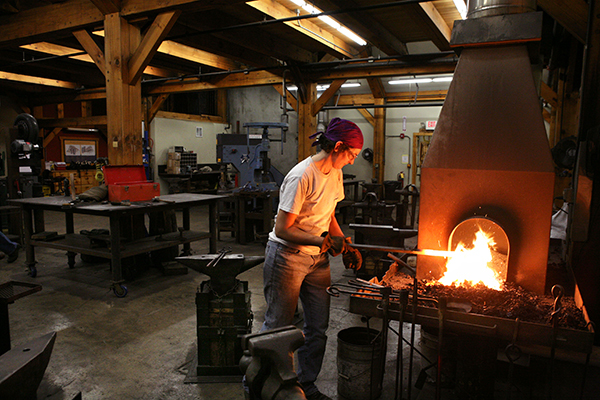 The hosts at the Folk School keep the show running smoothly and they are fully involved in the daily life of the School for a four month period. Without further ado, let’s get to know Donna Glee! CP: What first brought you to the Folk School? DGW: From 1994 to 2015, I worked at the NC Center for the Advancement of Teaching and we created weeklong intensive seminars for public school teachers in all manner of subjects with the goal of helping them reconnect with their passion, pride, and love of teaching. In that time, I worked with many fabulous local craft artists. I wanted come learn about this resource that was so close and make connections with the people here who could be possible presenters for my teachers. That’s what got me to the Folk School for the first time. CP: What inspired you to apply for the Host position? DGW: When I left my job to be a full-time writer, I knew I wanted to add craft adventures to my life. I wanted to continue to work with top craftspeople and have these experiences of the hand that by some mysterious alchemy wind up coming out as material in my books. Living the life of the full-time writer, I knew I would not have the funds to make that happen, so the host position was an ideal program for me. I don’t know how what I learn here will come out in a book, but there is a strong likelihood that it will. Right now, I am working on a book that is the residue of an experience I had in 2008 when I was a Fulbright fellow and went to India to study certain small, desperately poor communities are declaring independence from pesticide use and raising cotton without chemicals. Fiber arts have often been a focus in my work. CP: How does craft play a role in your stories? DGW: A lot of my writing is inspired by the work that I’ve done with craft artists. 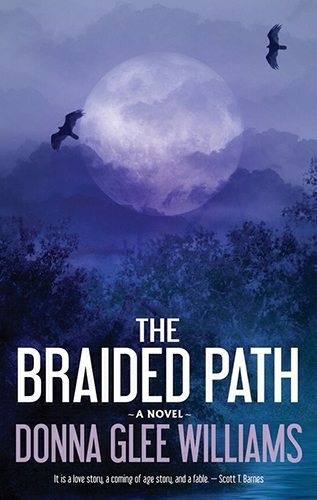 My first book, The Braided Path, is all about the twist humans put in fibers to make them stronger. 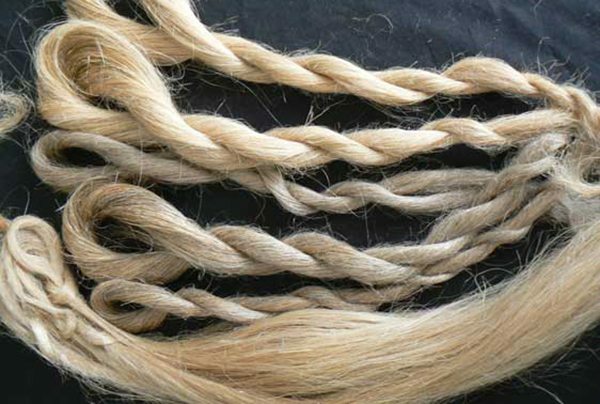 In my opinion, the discovery of how to twist fiber is right up there with the discovery of fire, in terms of making humans human. It’s a profound cultural universal, it’s a profound metaphor for life, and its a profound item of physics. I learned about this idea mostly from the local weavers and fiber artists Susan Leveille and Cassie Dickson, who both teach at the Folk School. And also from aboriginal studies and traditional outdoors skills teachers like Steve Watts at the Gastonia Museum and Cherokee artist Davy Arch. Many sources of inspiration like these went into my mind and came out in The Braided Path. 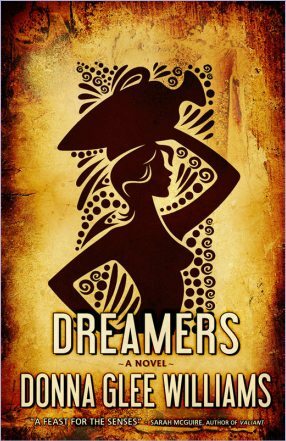 When I was writing my second book, Dreamers, the thing that kept coming back to me was the image of women helping each other. I don’t do research, I live my life, and then my life pops out in books and stories. 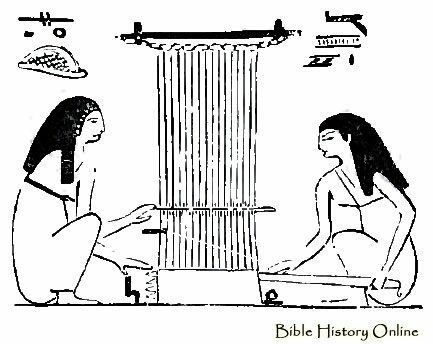 Images like this of women helping each other at large looms, those images were very present to me when I discovered that my main character meets a weaver and she becomes an apprentice. CP: Have you always been a writer? DGW: I think so. I remember writing my first poem in second grade. I didn’t always experience writing as something that could be a person’s profession. I wasn’t born into a family where that was a real possibility, so the idea materialized over the years. I have a character in one of my books who has a deep vocation for a craft that doesn’t exist in the world she lives in. I think that is a little bit me. What my character does, is she just keeps traveling until she finds the world where the craft exists. CP: You travel a lot and have lived many places. Can you talk about the wanderlust appeal? DGW: Some of it was from my family. My dad loved adventures. He ran off to Mexico as a young man and took my mother. I was born there. He did important and interesting work there, defending our food supply against plagues of cattle. He was not happy behind a desk and I may have inherited a bit of that. I am more awake when I go different places. When you stay in a familiar place where you know what everything already looks like (and sounds like and tastes like), your mind can fall asleep a little bit because you are comfortable. It already knows what to expect. For me, to have my senses fully awake, I love to be in a place where the plants are different, weather is different, people are different. I just love noticing things. I love adventures just like my parents did. I love being in places that other people don’t get to. I was in Iceland about a month ago and didn’t really get to all the tourist sites. I stayed in one town and walked the same walk everyday, sat in the park, talked to people, watched the flowers change. CP: I love that! It reminds me of when I went to Ireland and my host told me that I should “go an inch wide and a mile deep,” as opposed to a “mile wide and an inch deep” when traveling around the country. I think he would have liked your style of traveling. DGW: When I was in Ireland, I stayed for two weeks in Limerick and one guy told me “most people don’t stay for two weeks in the whole country.” I like being and living in a place for a while, not just going to tourist spots. I also like working in a place. You have a different experience of a place if you have a bit of a job there. CP: Congratulations on recently publishing not one, but two novels. Writing a novel is a thing that many of us say we want to do one day, but rarely get around to actually doing it. What inspired you and how did did you get started? 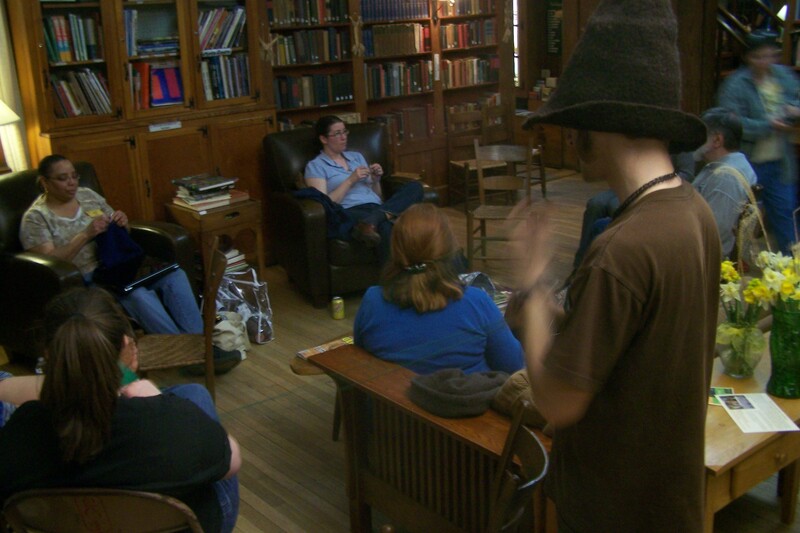 DGW: My first novel started as a short story and it started at the Hambidge Center. That’s an artist retreat in north Georgia that was born around the same time and from the same impulses as the Folk School. I was on a walk uphill and the thought just drifted into my head, “What if this uphill path kept on forever?” That’s the kind of thing you think when you are climbing a hill. Then the academic part of me chimed in (I also had recently completed Wilderness First-Responder Training), I thought…well the temperature would change 4 degrees for every 1000 feet, humidity would change, barometric pressure would change, plant life would change, which would affect animal life. Society would develop differently because it had different resources. The next morning, I began what became my short story “Limits.” The story kept going for me and over a period of a couple years the whole novel, The Braided Path, came out. A lot of people helped with editing and guiding and I was able to find a home for it. It was a very slow process. Now on the other hand, Dreamers started with an image. For years, I’ve done a process of projective dreamwork with a great dream theoretician Jeremy Taylor. I record my dreams and then once a month I talk with Jeremy about these dreams. Out of that process, and out of my own long-term history of insomnia, came the image of a young woman in a dark room with a scribe waiting to write down her dreams when she woke up. I knew that the young woman had insomnia. Elucidating this dilemma and how she would get out of the pickle is how the novel started. CP: Do you have any rituals or practices when it comes to writing? DGW: Journal practice is a large part of my writing process. Many years ago, I read Natalie Goldberg’s Writing Down the Bones and I adopted the idea that you write for a certain timed period every day and you don’t stop writing until that period is done. Of all the practices that have come and gone in my life, that one I’ve stayed faithful to. All of my books have been written into 20 minute chunks (I’ve built up to 25 minutes now). I draft by hand for 25 minutes and then I transfer it into my computer, which is the first evaluative pass and clean-up. Then I plow forward and don’t look behind. CP: What do you like about fantasy/sci-fi genre? DGW: I love to read exquisitely well-written fantasy and science fiction. In my life, I did the whole “being a grown-up” for a number of years. I got an MFA in writing, I wrote contemporary introspective realism, and explored my inner landscapes until I was just about sick of myself. I gradually stopped writing. It ceased to be a center point in my life. About 10 years ago, I started accessing the part of me that first loved reading, which was probably around junior high school when I first encountered authors like Ray Bradbury, J. R. R. Tolkien, Anne McCaffrey. By letting that part of me out to play, I revitalized myself. I was able to publish my first books. I never even wanted to write a novel before and now that’s my main thing. CP: Do you have a fiber arts focus here, or are you taking a variety of classes? DGW: I’m taking all sorts of different classes. I do not know what I will take, but fiber arts seems to be something I come back to. 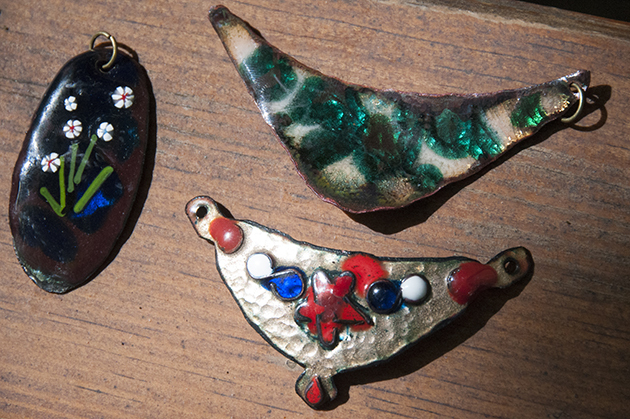 So far, I’ve taken Enameling, Broom-Making, Nuno Felting, Clay, and Drawing. CP: I heard you taught a class unexpectedly! What was that like? DGW: That was a bit of an adventure. The school had an instructor cancel two days before the scheduled class. They invited me to teach it, as the subject matter was very much in my wheelhouse. The class theme was “The Power of Play.” When I’m helping people as new writers, one of my big things is to bring out the child part of them. Many of us have powerful editing parts, or strong technical parts, but to learn to access the child play part is my special calling. I was very happy to do that. I will be back next year to teach my “Write What You Don’t Know” class. Many novice writers get the advice: “Write what you know.” My wisdom is, if you already know it, why would you write it? I’m interested in the things you don’t already know and believe that some part of your mind is wiser than your conscious self. It offers you help if you are lucky and open. CP: Have you been writing a lot since you’ve been here? I know being a host is a busy job. DGW: I have not. When I came I planned to take every other week as a write in week. 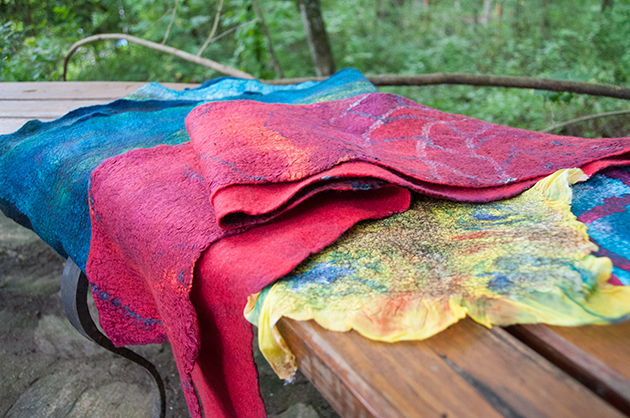 Last week was supposed to be my writing week, but I walked into the Nuno Felting class and thought “I gotta do this.” So I don’t know what I am going to do, but writing is not happening here, but that doesn’t mean that it’s not getting fed. CP: Where can people find your books? DGW: I have them available here at the Folk School while I’m hosting, your local independent bookstore can get them for you, or you can always go to Amazon. I’m open for business and I love it when people read and get in touch. 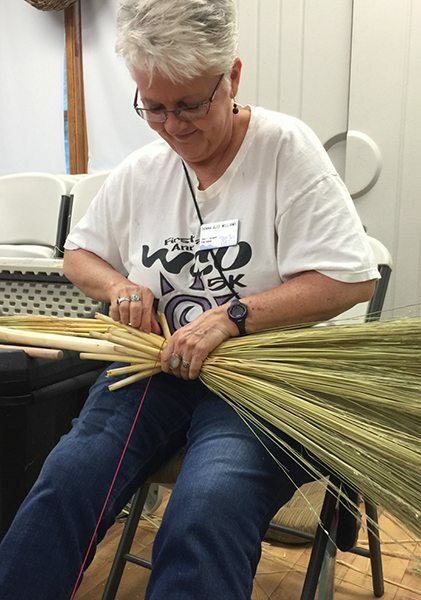 The folks who come to the Folk School are my ideal readership because my books are steeped in pre-industrial technologies–weaving, rope-making, spinning, netting, knotting, dyeing, pottery–you name it. In The Braided Path, the whole society is organized around craft. Every person has a craft. My ideal readers would be makers. DGW: I’m just so grateful to be here at the Folk School. This is an opportunity of a lifetime. CP: Well, we are just so happy to have you! It’s been great sitting down with you. 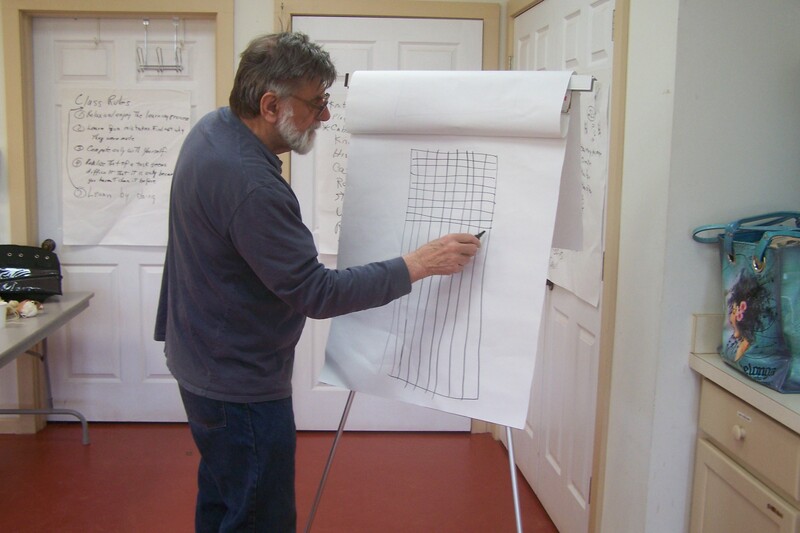 View upcoming Writing classes at the Folk School. What happened Wednesday in the Aran-Gansey Class? Donna, really enjoyed this. We have an active group of writers in the mountains, most of whom are part of the NC Writers’ Network. 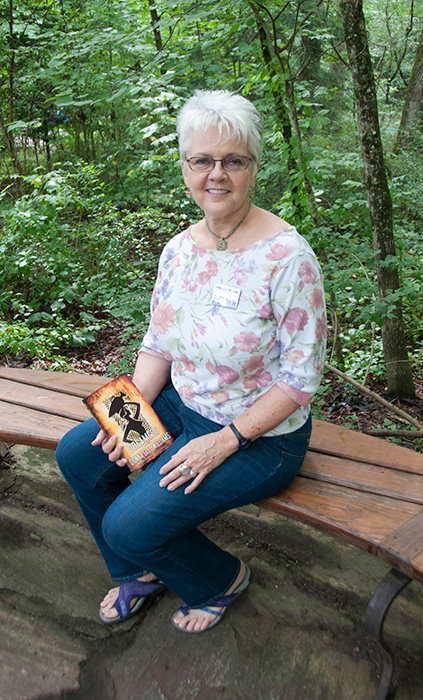 I wanted to invite you to Writers’ Night Out in Blairsville, GA on the second Friday of the month at 7 pm. We have featured readers and an open mic for anyone who wants to read their work for 3 minutes each. You can sign up for open mic at the door, and we’d love to hear you! It’s at the Union County Community Center, and it’s fun! Next one is Sept 9 and features 2 award-winning poets who teach at Young Harris College. (I also teach writing at the folk school but don’t have any classes on the calendar at this time). Wow! Donna! The Folk School is lucky to have you. What a cool profile for a host! Thanks Leah!!! I miss you and the Folk School does too.